The Israeli-Palestinian dispute over land in the occupied territories has come to a Montreal courtroom this week. Lawyers for the West Bank village of Bil’in are suing developers Green Park International and Green Mount International, which are registered in Quebec, for building settlements on land that was confiscated from the village by Israel. Prior to the start of the hearings, Mohammed Al-Khatib, who serves on the village council and is one of a committee of people who organizes weekly non-violent protests against the occupation, and Emily Schaeffer, a lawyer with the Israeli law firm that has taken on Bil’in’s case, traveled across Canada to explain why the village was suing the developers. Their tour was supported in part by Kairos, an ecumenical social justice organization of which the Anglican Church of Canada is a member, and numerous other organizations. Late in 2004, Israel constructed the part of its security wall that cuts Bil’in’s land in half, Mr. Khatib says. 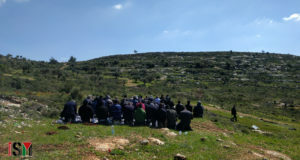 It separated the residential part of the village from the agricultural land where they cultivate olive trees. In this place, he said, the wall is 4.5 km into Palestinian territory, outside the Green Line. The villagers were not offered compensation for the land that was taken, he said, but added they would not have accepted it anyway because they want their land, not money. Since the land was confiscated, parts of it have been used to build communities for Jewish settlers, and Green Park International and Green Mount International are the developers that have built the homes and buildings. 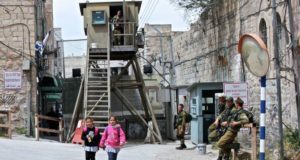 The case, Ms. Scaheffer said, is based on Canadian legislation called the Crimes Against Humanity and War Crimes Act of 2000, which incorporates the fourth Geneva Convention and the Rome statute of the International Criminal Court and calls settlements a war crime. Bil’in’s lawyers are asking the court to declare that settlements are illegal, to stop the building of new structures, to remove the buildings and restore the land and to rule that each company must pay a penalty of $2 million and the registered director must pay $25,000. “It’s important to say that this is not compensation for the loss of the land but only a penalty. There is no price tag for this land. Bil’in is not interested in selling,” she said. “The next thing that is bigger than Bil’in and even bigger than Palestine is the idea that corporations need to be held accountable for violating human rights and violating international law,” she said. The case is in its early stages. Filed in July 2008, this is the first time the two sides will appear in court for preliminary hearings on three motions filed by the corporations to dismiss the case. Ronald Levy, one of the lawyers representing the corporations, was unavailable for comment, but CBC reported that he planned to argue that the case should be dismissed because it is not the right jurisdiction for this issue. 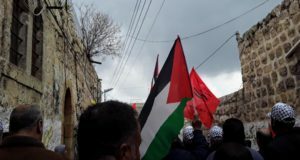 Bil’in is known for its non-violent approach to protest, and it has many international supporters, including Israelis, who come to show solidarity with the villagers for weekly protests, and on anniversary days when there are larger demonstrations. Mr. Khatib says there are sometimes hundreds of Israelis protesting with them. “The struggle came to us, so it forced us to struggle, but also we [were] waiting for this chance to do what we think is a good way to resist, which is the non-violent resistance,” he said. Still, this kind of protest can be dangerous and has cost the villagers dearly. Mr. Khatib said thousands of protesters have been injured and, in April, a friend was killed when he was hit by a tear gas canister at close range. The canisters are meant to shoot as far as a half a kilometer, so they are like rockets, Mr. Khatib said. The preliminary hearings are scheduled to wrap up on June 25.